Unless you’ve been living under a rock (or maybe one of these gorgeous limestone quarries), you’re well-aware that Texas summers are absolute scorchers. With the advent of these blazing months, most state residents opt to lounge in the air conditioning over spending the day outside. As various Texas cities compete for the record of the most consecutive-100-degree days, folks are looking for relief from the offensive heat index and oppressive humidity. Lucky for us, the Texas Hill Country is loaded with lakes and rivers to counteract the heat! These are not only great places to cool off, but also some of the most picturesque locations we’ve ever seen. In honor of these oases, we made a list of our favorite waterways in the area to cool off this summer. Located in the picturesque community of New Braunfels, the Comal River is the local favorite spot for a day of tubing. Its slow current, crystal-clear water, and gentle rapids keep the ride refreshing and fun. Note: This is a popular spot for tourists and students, so get there mid-morning for the perfect balance of hot sun and light river traffic. Grab a tube with a bottom and bring some drinks to stay hydrated! In the heart of San Marcos, the Rio Vista offers plenty of dreamy spots to lay out and have lunch between swimming sessions. Bring a tube to slide down the rapid (the center point of the park) or go climbing on the rocks in the water to sunbathe like a walrus. Arguably the ultimate Hill Country lake getaway, Canyon Lake is an excellent place to book a weekend with friends and family at a fabulous waterfront house. Take out the jet skis, lay on the dock, or head out on the boat for some wakeboarding and fishing. There are also plenty of beaches to hang out on while the little ones splash in the surf. A hidden gem in the Hill Country, Wimberley has always felt like a place directly out of a storybook. Blue Hole is the local favorite spot to go for a quick afternoon swim with the family. The Wimberley folk fought to keep this place free from developers and turned it into a city park. If you head out there, you will notice the loyalty and care that residents show for the area. Fed by natural springs, this swimming hole could not be more idyllic. Schumacher Crossing is a swimming hole revered by Hill Country dwellers. This spot holds special appeal due to the crystal-clear water and secluded location. If you make your way out to Schumacher Crossing, you will understand the desire to keep this place clean. With waterfalls and towering trees, it’s an oasis for the Texan weary of city life. If you don’t quite have the time to make the trek to a rural Hill Country waterway, Boerne City Lake Park is perfect for you. Located just north of downtown Boerne, the lake features tons of amenities, including a fishing pier, volleyball courts, disc golf course, a butterfly garden, and (of course) a big beautiful lake to enjoy. Looking for a swimming spot that also has great camping options? Blanco State Park needs to be on your list for this summer. The park offers RV and primitive camping, plenty of trails for hiking, and more than a few places to go fishing. The water is spring-fed and well-sunned, keeping it at a cool and sunny 68 degrees- a perfect combo for a refreshing swim. Reminiscent of a hidden Aztec treasure cove, Hamilton Pool in Dripping Springs is both beautiful and accessible. Swim underneath waves of ancient limestone and marvel at the natural beauty. When you don’t feel like swimming, walk around under the cave for a short exploration. The Guadalupe River runs through many of the towns in the Hill Country, but one of the more accessible places to go tubing is in Canyon Lake. Try the Horseshoe Loop for a social float and meet some new friends while soaking up that Texas sun. Spring Branch is home to Guadalupe River State Park and is a perfect place for San Antonio city-dwellers to get away for the weekend without driving too far. The main river area is a relaxing space with tall cliffs and plenty of space to play. It is an ideal spot to camp, hike, and kayak as well, so plan on making a trip out of it! Sewell Park in San Marcos plays the gorgeous bank of the San Marcos River. It is one of the best rivers for light swimming and is spring-fed, making it a cool 72 degrees all year round! If you walk under the bridge, you will find a powerful waterfall with beautiful areas to explore. Bring water shoes to walk on the rocks! Lake McQueeney sits just south of New Braunfels and is one of the top places in the area for a lake house getaway weekend. Take the boat out for water skiing, jet skiing, and fishing, and try your luck at catching some largemouth bass around Treasure Island. Located about 30 miles west of Austin in Spicewood is Krause Springs. This 115-acre spot is listed as a historical site and provides places for primitive and RV camping. The area is made up of 32 springs, and most of them feed into a pool which then makes its way into Lake Travis. Try the rope swing and hang on tight! Wimberley must be some fantasy town that happens to exist in our Hill Country. Proof? This small town plays host to Jacob’s Well - a small swimming hole that sinks to 120 feet before opening up to mysterious underground tunnels that are still being researched. Nevertheless, it has been on everybody’s “must-see” list for crazy swimming spots in Texas. 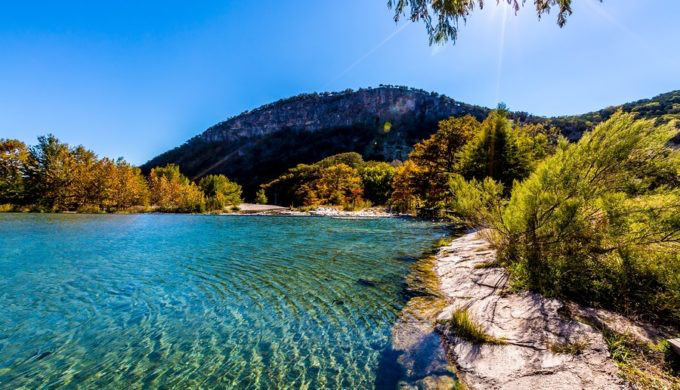 The famous Frio River runs through Garner State Park and is practically begging you to jump in. Go for a nice long hike before a refreshing dip into the Frio. Grab onto the rope swing and test your bravery as the summer sun does its thing. This is a very popular place that people from all over come to visit, so prepare to make some friends and dance the night away under the stars!